Rental 4 to 8/9 people. Lovely old house renovated and charm in the heart of the castle park. exceptional .A Haven - Possibility linens. - Cleaning included. 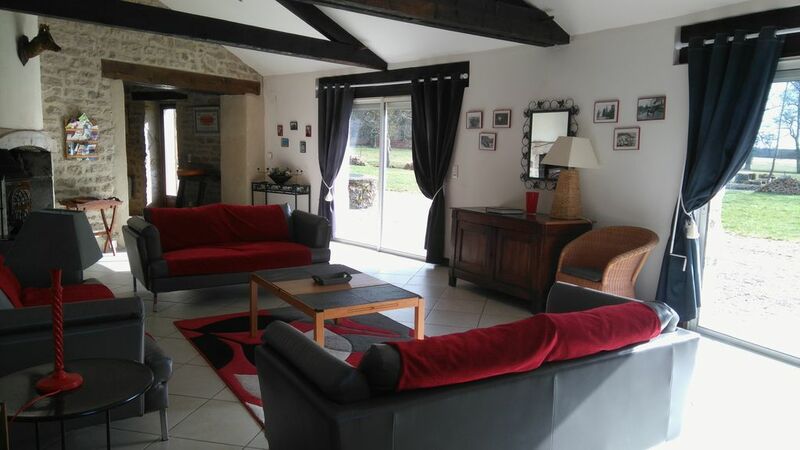 - Many recreation, restaurants, coast wine (Beaune 20mn). Large spacious living room with three comfortable sofas and armchairs, TV stereo, opening bay windows to the garden and the castle, large kitchen and dining table dining, great room parent with wardrobes and en bathroom next door, and three other bedrooms upstairs with a shower room, 2 separate toilets. Peace and quiet .The house is located near the pool at 60m. It has two high winds to keep the evening. Framework and instead of quality. The wood is nearby and you can take long walks. There is a pond for fishing and a boat. The pool is heated in a large closed session. Shared pool on the park in a very large enclosed with padlock on the door is heated by a heat pump between 25 and 29degrees. Everyone has a place! Linen to take optional rental: towels and sheets installed before arrival. Possibility baby sitter on request. A book with all leisure in the library lounge. Looking good barbecue in the garden. We were two families with 5 children staying with Marie at her beautiful country house. The hosts were very warm and welcome and the house had all necessary equipment. Since this was May it was a bit chilly and the house was cold during night and mornings even though we tried to keep the fireplace burning as much as possible. The surrounding was great and the children adored the pool and play area. The nearby lake and little boat was also nice. We were able to easily drive to vineyards such as Mersault, Vosne Romané, Beaune and Corton within 30 Minutes. On the grounds of the Chateau of Musigny this former barn offers tradition and modern comfort. We thoroughly enjoyed the remarkable quiet and magnificent meadow and forest views of this nicely equipped large cottage. This is a perfect location for exploring Burgundy. It is also a perfect place to relax. Marie and Aurelie are very welcoming (their English is a lot better than my French) and the house we rented is great. There is a good kitchen, large living room and the main bedroom is spacious and comfortable. The area around the house is ideal, with plenty of room to run around or relax in the sun (depending on your age), and we took advantage of the bar-b-q on several evenings. We had some great weather and the pool was a perfect option for a relaxing day or a quick dip after seeing some sights. Arnay-le-Duc, the local town, has everything you need including a boulangerie, where we went most mornings for delicious croissants and bread, and Supermarkets for everything else. There is also a lovely little beach on the lake with a play area for the young ones. Within an hour’s drive of Musigny there is so much to do that we ended up going something almost every day. Particular highlights for the nippers were Parc des Combes (a funfair in Le Creusot), Lac des Settons (where there is a beach and a Bouncy Castle play park), the steam train ride in Blingy sur Ouche, and the Dinosaur Parc (called Cardoland) in Chamoux. Très beau gite situé sur le domaine du chateau de Musigny. Idéal pour un séjour en famille. Merci. ,espérons vous revoir. Bonne semaine. quinze jours idylliques en Côte d'Or, à mi-chemin entre la Bourgogne des vignes et des forêts du Morvan : visites de caves et grandes balades à deux pas. La maison du Parc est bien conçue, ouverte sur le parc, à proximité immédiate de la piscine et du château mais permet de garder son indépendance, sans aucune nuisance. Merci enfin aux charmants propriétaires des lieux, sympathiques et disponibles. A vous revoir à la maison du parc pour des vacances le plus vite possible !! un accueil chaleureux dans un beau gîte, bien équipé aussi bien a l’intérieur qu'à l’extérieur. Piscine chauffé (28°) barque sur l'étang et balancelle pour les enfants. une belle maison à l'écart du village dans un grand parc, nous a permis de profiter du calme. Un grand merci à vous pour votre venue, nous espérons vous revoir.